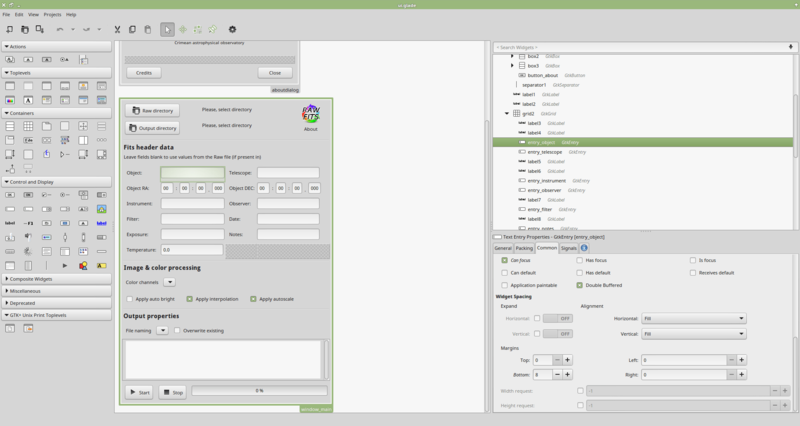 Program is written in pure C with GTK 3 user interface. All external dependencies is only LibRaw (latest stable versions from official site is much preferable than versions in distros) and cfitsio. LibRaw is used for reading images and metada from the RAW files and supports a great amount of cameras vendors and models. Cfits is a popular C library for working FITS files. Mainly designed for Linux, but i believe that it can be compiled and successfully run on OS X and even Windows OS’s. All question is in build procedure and dependencies resolution. Program is under active development and improvements so some of the points at this article may be deprecated, sorry. All you need is just set input and output directories, fill up some text fields and press “Start” button. All entered data will be written into FITS headers according to FITS file standard. All conversions is doing in background threads, number of this threads depends on count of your cpu or cores. Is made using Glade designed. It’s simple and intuitive (mostly 🙂 ) Here is how it looks in designer. Click on the image to see full resolution. This is a good start point. Here i will say only that Glade doesn’t produce any code. Only one generated output is a custom XML file with description of all your windows and UI components. Now you can get any element from this schema by it name using gtk_builder_get_object (), for example some widget named “windowname”. Please check out file src/main.c in my source tree to discover how i loading and accessing different types of components – buttons, text inputs and so on. Another interesting note about GTK UI is that only one (main) thread is allowed to update UI. In my case i has a multiple threads which reporting about conversion progress and printing some messages that should be shown somewhere in UI. But how to do UI updates from this background threads without ruining GTK runtime? Good solution is use GTK idle source with attached callbacks. Somewhere in your threaded function you should create GSource object using g_idle_source_new () the with functiong_source_set_callback(gsource, functionname, arg, NULL) you can create callback to function functioname with your custom argument arg. After that you functionname with argument arg will be called in the main thread. This function may implement some UI updates and arg may be some data, that should be displayed. return G_SOURCE_REMOVE;  // don't forget to return this value! Please check out logger_msg_preformat () or progress_update () in src/main.c to see how it works.